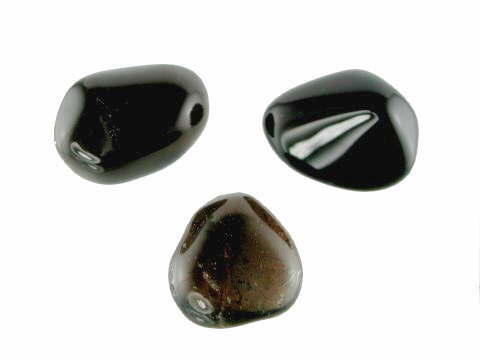 Set of 3 large Smokey Quartz tumbles from Brazil - great colour (lighter and much better than they appear) - excellent for gridding, to carry with you or to have at work or home to protect against negativity. Grounding, anchoring, protective. This powerful and extremely useful stone soaks up negativity and electromagnetic pollution like a sponge, so it needs regular cleansing - The Cosmic Super Sponge! In fact it does its job so well that no home should be without a good piece of Smokey Quartz and it doesn't have to be large or fancy - tumbles work just as well. A firm favourite but still hard to find good quality specimens set in jewellery. Smokey Quartz is naturally irradiated Quartz which comes from surrounding rocks during its development. It is often found in granite rocks which emit a small, but persistent amount of radiation. Unfortunately a large proportion of Smokey Quartz available commercially today has been artificially irradiated to produce a dark colour. However, natural specimens of this crystal are still available worldwide, with notable producers being Brazil, areas of Colorado in the US and Switzerland. There is even a variety from the Cairngorms in Scotland. The darkest natural variety is called Morion Smokey Quartz.